Blackwork embroidery today is generally a counted thread embroidery technique. In the Ancient Days of Long Ago (16th & 17th centuries) it was worked both ways – counted and free style surface embroidery – and sometimes a combination of both. My current project is not necessarily meant to be Blackwork Proper, but I’m going to call it blackwork, because, after all, it is blackwork. It’s black embroidery worked on white linen. What more does it need to be? Here’s an update of my fish. I’m embroidering this fish in the same way I would go about doodling on anything – randomly stitching patterns in spaces that cover the fish shape. I’ll try to keep it looking somewhat like a fish, and I may work in some patterns that are specifically related to fishy things, like netting, or maybe shells, or something. I’m also contemplating adding some teeeeny itsy bitsy tiny vintage beads when I want to work tiny dots. I think I have some black ones that are a microscopic size (24?). We’ll see as we go on this one! Here we are, so far. The threads are nice – half of them are what I would classify as “very fine,” and the other half are more substantial. The two finest weights remind me of Piper’s silk (or Helen Stevens’s TESS embroidery silk). As the threads progress in size to greater thicknesses, the twist in them becomes much more noticeable. The heaviest thread (which makes up the line under the fish’s chin in the photo above) is a z-twisted silk about the weight of #8 or #12 pearl cotton, I’d say. 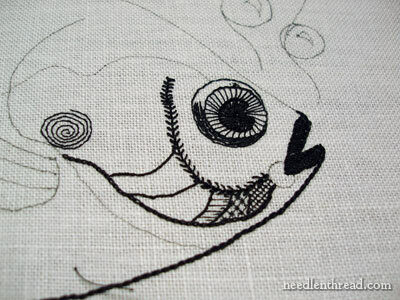 So far, I like stitching the fish! Now, if blackwork isn’t your thing, and you’re thinking this is just a really Super Weird project, if you think of it as surface embroidery and imagine it done in another color, you might like it better. But be honest – what do you think of this project? I wonder if the fish is worthwhile. Do you suppose it tends towards boring, being all black and white? Does it grab your interest and is it something you want to see progress? What’s your take? I’ve also managed some stitching on the Floral Glove, which I’ll show you later on. And the post office delivered a package pick-up card this morning. I suspect it is Embroidered Flowers for Elizabeth, and if so, I’ll be giving away a copy of it very soon! So keep an eye out! I like the blackwork fish. I think things could get very interesting if you do a variety of stitches. Keep at it! i like it very much so far, and i can't wait to see it finished! Mary, I am realy liking the fish. It's a wonderful way to see the stitches because there is no being distracted by a great variety of color. Plus, it's interesting to see what stitches you will place where to keep it looking like a fish. I probably wouldn't do a fish myslef, but might be tempted to try this on a detailed bird. I like it too! I actually like working with one color – currently working on some monograms in dark blue! When I inventoried my needlework projects earlier this year, I found a kit I bought in Scotland of a favorite castle we visited. The castle is roughly sketched on the fabric and it is meant to be worked in blackwork. Having never done blackwork, this project has never been started. Following your progress on the fish is very instructive and helpful. Now I feel I could actually do it! Thank you Mary!!! Hmm..to be frank I don't like the look of it (as of now) But its too early to form an opinion. You've just begun!! Go on…stitch a little more and let us see how it turns out.Sorry if I've offended you. I think it will be very interesting. I love working with just one color as it really showcases stitches and techniques, although I find I have to be more precise. I can't wait to see the finished fish. Have you found a source for these threads? I've been searching and haven't found one, at least not in the US. What do I think of this project? I love it!! I'm already trying to start transferring office doodles into something embroidered and this technique looks like a really interesting way to do it. So, I'm very excited to see how it goes. I am loving your fish! The black threads tend to focus your attention on the stitches without the distraction of color. I hope you power right through this project, because I am very anxious to see where you take it. The face so far is just enchanting. I really, really like that fish. I haven't done a whole lot of work with one color, but of all the one-color embroideries I've seen, I think the blackwork ones are the most powerful, most distinctive ones. I'll be really anxious to see him when he's finished. Forge forward! I like it very much, especially the eye. Don't get discouraged with it. Somethings just don't seem quite right until it's all done and then wham! it looks terrific all put together. So many projects of mine almost ended in the trash because I thought they were boring or downright ugly. But when finished, they were quite nice after all. I love the textures and details. That's what makes blackwork so interesting. I'll be waiting and watching. Original Blackwork was reversible, done on sheer or net and backtracked on itself to make it look the same on both sides without carrying any threads. Evolved into our beloved cross stitching with black colored thread, not reversible since that is usually done on canvas. I feel that we need to keep those traditions alive; name and all! That's not to say that we shouldn't evolve in our application of methods, only that we should try to keep intact the original names and methods for history buffs and researchers. Maybe we can call it Black-on-White or Freestyle Black-on-Canvas? Yes, I'm a stickler I'll admit! I have always liked a black and white combination because it looks so striking. As for fish? What's not to like about a fish? I'm still toying with starting to make the black & white crazy quilt from the 2009 Piecemakers calendar. I think you should definitely keep going. It looks interesting and I want to hear about the different threads. Hi Mary the fish is looking good i like the way you are putting your own spin on black work. I love your fish. Reminds me of those we caught as kids when holidaying with Nanna. The wharf, into a quiet bay, was just a short distance from her home. We'd catch a few then race to the house where Nanna would fry them up straight away for our breakfast. Yummmmmoh. The eye is a bit spooky tho. Just how I like it! Anyone in camp who complained about the food had to do the cooking. One bloke said "This bacon sure is salty, just how I like it"!! No, the eye is so good. In this case, being spooky means it's looking right at and through me. Wonderful. I have a big file of blackwork pictures and projects and photocopies from magazines etc. Always appeals. Just have to keep any I find. So am enjoying this project immensely. Thanks, all, very much for your comments! I've worked a little bit more on the fish, and the more I work on it, the more I think I really do like the project! It'll be fun and challenging. It's certainly interesting, anyway, to stitch without guidelines – you really have to look ahead and figure out where you're going and how you're going to get there evenly! At the same time, it's kinda fun just to do whatever you want in a little area on the piece. Laura points out that blackwork was done on sheer net in reversible stitches. This type of blackwork adorned cuffs, sleeves, ruffs, etc. But blackwork was also worked in bolder patterns, in surface stitches, with various filling, on linen back in the day. Take, for example, this (circa 1600 – 1630): coif, worked in black silks on linen, or this coif at the Platt Museum in Manchester, England. Both of these, though not what we normally associate with "blackwork" (the Holbein stitched embroidery at the edge of sleeves, ruffs, and so forth during the Elizabethan era) are called blackwork by the museums that house them. I don't blame you for being a stickler, but I figure if all the blackwork designers and patterns and everything floating around today, worked on aida, linen, canvas, and so forth, can be called blackwork, I'm ok using the name, too! Cynthia asked where the threads can be found in the US – they can't, as far as I can tell. However, you can contact Mimi's Attic Needlework Shoppe and request the threads, and they may be able to get them for you. Leon Conrad will be there at the end of next month, so when I contacted them, they asked which threads I wanted so they could get current pricing. If you want to special order some of the threads, just drop them an e-mail to see what they can do for you. It's a very nice collection. Deepa! I hope the project improves enough to meet with your approval! You're right – there's not much there so far, to judge. Monochrome stitching isn't always the most exciting thing in the world, and a fish is not the most endearing creature – so I'm with you! We'll see how it goes! Thanks, everyone, for your comments – I think the project will be fun, and I'll keep you posted on progress! I really like the blackwork. I do a lot with redwork. I am not especially fond of the fish, but I like the results, so far. I did contact MIMI"S ATTIC and she is getting the info for me and will get back to me. I have only used regular cotton and silk floss for my stitching. I am looking forward to expanding my inventory of threads to experiment with. I also want to ask a question that I haven't seen anywhere. When doing regular and surface embroidery, how big/small should the stitches be. In stem stitch or backstitch I usually try to keep my stitches about 1/8th inch or less. Is this too small/big? This Lady-fish is great. Look at her lips, she is a real lady. And I like very much, how is she looking at the moment. Hope to see the progress soon. Thank you for sharing this great post.Keep sharing. I love this fish! I am excited to see more progress on him-I guess it is a boy fish-but maybe a very stylish female fish! At any rate-I love the fish-I hope you finish the project. I am really excited to see what progress has been made. This is amazing. I have been looking at doodle embroidery for a while and wondering if I would have the patience to attempt it. I have been doing it with free motion machine stitching and it is extremely meditative but the results are not as visually precise as what I can see this will be… I may have to go the hand route. I love how the different thickness of threads mirrors your line work. I love the fish. I just love it all! I love this, I came online looking for inspiration for a first time project..this is gorgeous!